1. 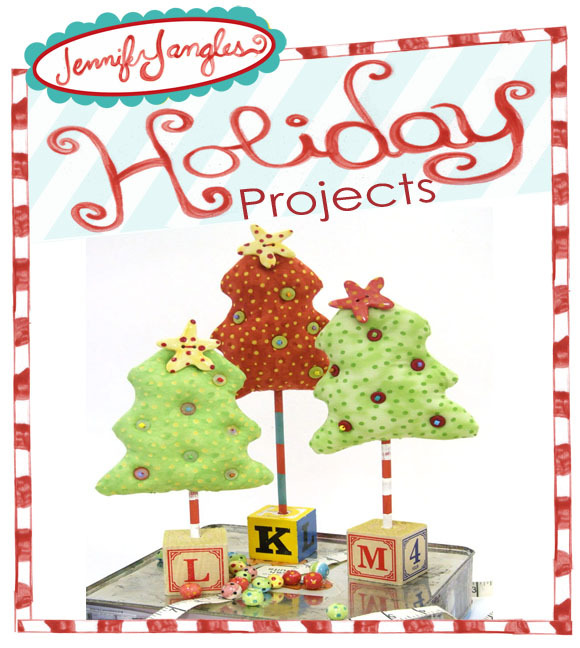 With your free Jennifer Jangles tree pattern, cut out two trees from the fabric. 3. Clip the edges up to the seam on all of the curves. Turn the tree right side out. 4. Fill the tree with fiberfill. 5. At this point you will need to decide if you are making an ornament or a standing tree. If the tree will become an ornament, then fold a piece of ribbon in half and insert it into the opening for the trunk. Handstitch the opening closed, making sure to attach the trunk as well. If the tree will be standing, insert the dowel into the fiberfill approximately three inches. (See below for base instructions.) Hand stitch the opening closed with a needle and thread, taking care that the dowel stays in the center of the tree. 6. 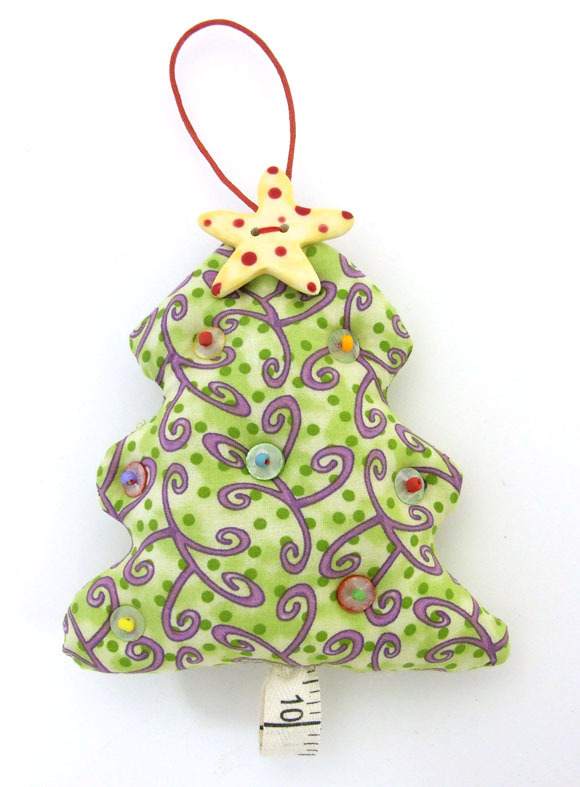 Sew the star button to the top of the tree and an ornament loop of the tree will be an ornament. 7. 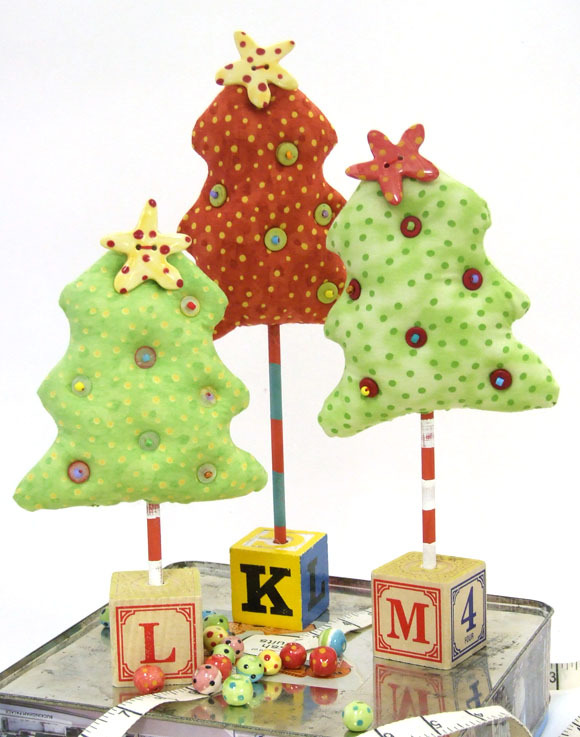 Sew the "ornaments" onto the tree by bringing your needle up from the back of the tree to the front. Thread a disc onto the needle and then a seed bead. Go back through the disc with the needle and into the stuffed tree. Sew on all of the beads with this method. Bases for the standing trees could be made from just about anything heavy. Here I used a childs wood block and a dowel rod that I painted. I drilled a hole approximately half way down the center of the block. The hole was just a bit bigger than the dowel. I used my hot glue gun to secure the rod into place. A tiny flower pot with clay would be another easy way to secure the dowel.